The trailer for Spider-Man: Far From Home was supposed to drop today, and while it did premiere at CCX18, the online release has been delayed until later on this month. However! 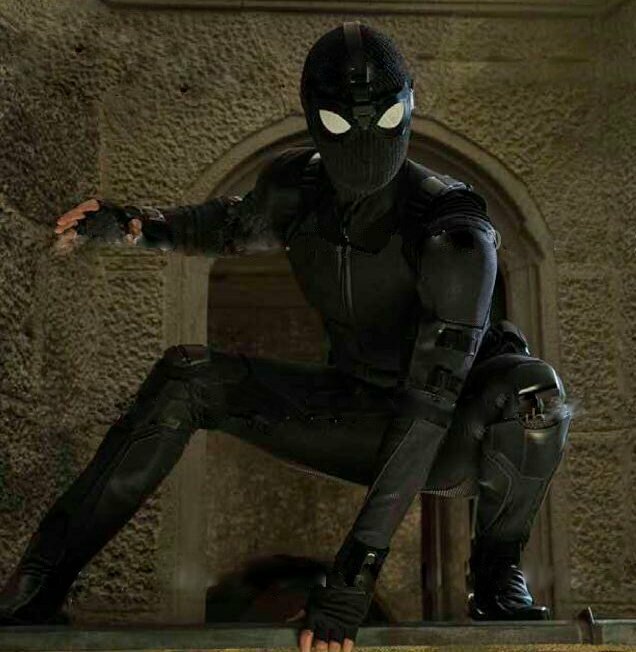 We do have a new photo to share with you today (thanks to Daniel R) of Peter Parker (Tom Holland) wearing his black stealth suit! We already knew that Nick Fury and Maria Hill would play a role in the story and that Peter Parker would find himself in Europe vacationing with his friends where he meets Mysterio, but things don’t go down the way you think between the two! According to Tom Holland (via SuperBroMovies), the movie will follow Spider-Man and Mysterio as they team up to take on the Elementals! I was not expecting this, but it certainly adds a cool, intriguing, and different story element! It will be really fun to see how this story and relationship plays out in the film! What do you think about this new information that has been revealed?